When working in a larger group or company it can be useful to share nodes. Not just share them, but also be able to share updates to shader networks more easily. For example technical artists or programmers may want to make a set of shading nodes that artists can use that match with their game engine. 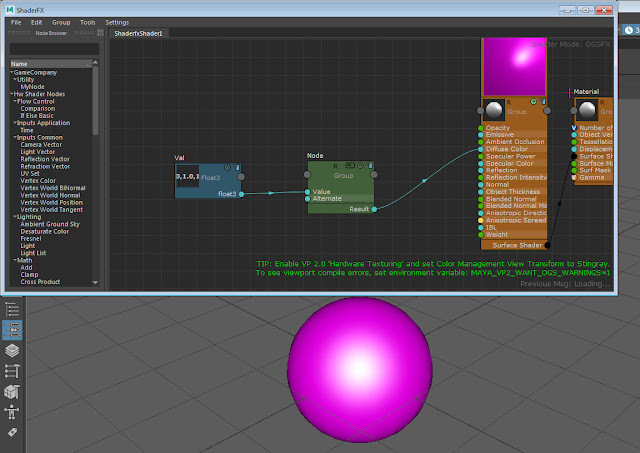 ShaderFX has this build into its group-nodes. Here is an example of how to create your own custom shader nodes for your company and share them over the network with your team members. With this set, the next time you start up Maya, it will now pull its custom group nodes from this network folder. 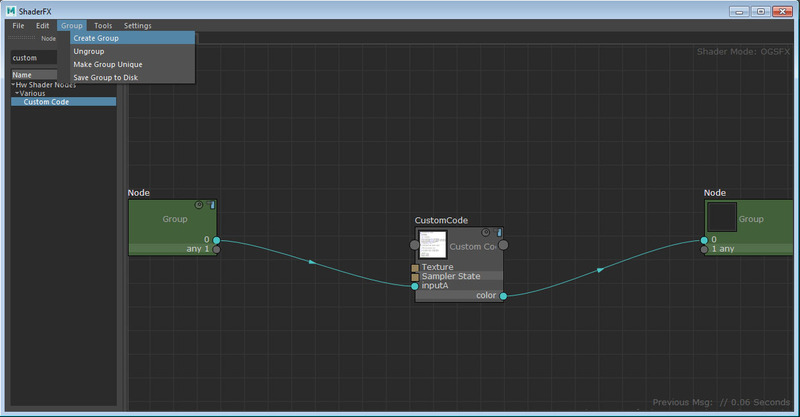 Now lets build a set of custom nodes. We will use the Custom Code node, since it allows technical artists and programmers to enter their own code more quickly instead of using lots of complicated shader graphs. 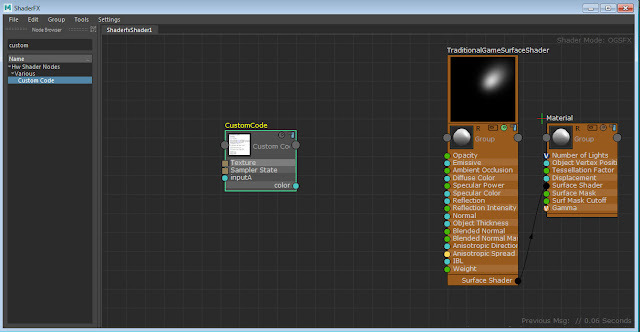 Enable "Advanced Mode" in shaderfx. Add a custom code node. Customize its code by selecting it and pressing "Edit". Select the node and use "Create Group"
Supply Class, Category and Sub menu name for the group. Add it to the scene and connect any inputs it needs. Save your Maya scene and close Maya. Create the Group node you created. Open it and make some changes to it. NOTE: make sure you create a valid node. 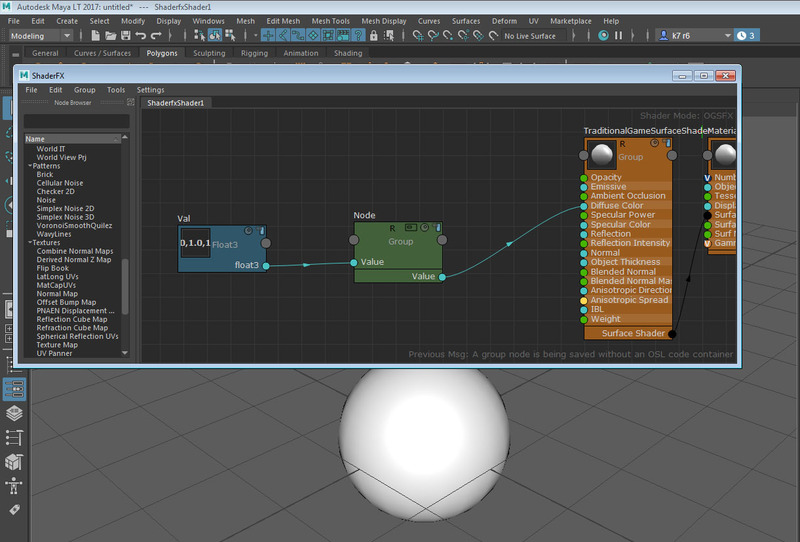 If you break the node, your original Maya scene will give a shading error. Re-open the Maya scene you saved previously. Notice that now the scene has been updated to use your new node.